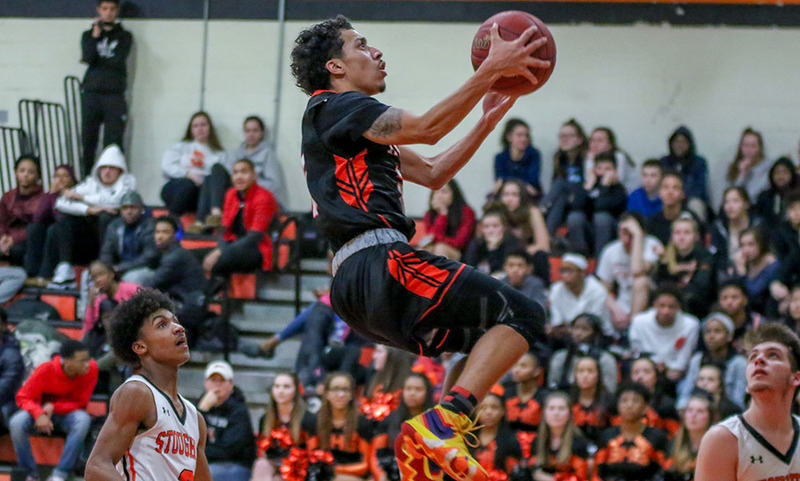 Attleboro, 55 @ Oliver Ames, 53 – Final – Attleboro overcame a 13-point deficit in the second half, outscoring the Tigers 21-12 in the final quarter to get the win. The Bombardiers trailed 35-22 in the third before closing the gap to 41-34 entering the fourth quarter. The Bombarders opened the fourth with a 12-5 run, tying the game at 46 with four minutes to play. Attleboro had a three-point lead but OA’s Sean O’Brien hit one from deep to tie the game. Attleboro senior Mason Houle hit two free throws with 20 seconds left and the Bombardiers forced a turnover with seconds left to secure the win. Houle finished with a team-high 20 points while Qualeem Chares added 16 points and eight rebounds. Kevin Velazquez scored all 13 of his points in the second half, including nine in the fourth quarter. OA senior Ethan Eckstrom had a team-high 15 points. Canton, 52 @ Stoughton, 58 – Final – Stoughton scored 34 points in the second half to pick up a key division win over rival Canton. Junior Myles Grigalunas-Powell was held scoreless in the first half but exploded for 14 points in the second half while Ahmad Jahed added a career-high 13 points to pace the Black Knights. Kevin Dixon and Tahkwan Gates Brown each finished with 11 points for the Black Knights, who trailed 26-24 at half but took a 42-36 lead into the fourth quarter. Devin Foster led Canton with 16 points. Foxboro, 63 @ Milford, 66 – Final – Milford trailed by 14 at halftime but used a spirited second half to secure the win. Milford scored 19 points in the third quarter, cutting the deficit to single digits (51-42) but then exploded for 24 points in the final period to get the comeback win over the Warriors. Brendan White scored 15 of his game-high 25 points in the fourth quarter and also grabbed 15 rebounds to pace the Hawks’ comeback. White put Milford ahead 62-61 after converting an offensive rebound, and Danny Corsini (11 points) came up with a steal and bucket to make it 64-61. Sophomore Jordan Darling added 15 points for Milford Foxboro had a look for the tying bucket at the buzzer but it was just off the mark. The Warriors, who were without leading scorer Brandon Borde, were led by sophomore Kevin Gallagher’s career-high 24 points while senior Anthony Mollica added 16 points. Mansfield, 73 @ Franklin, 72 – Final (OT) – Click here for a recap of this game. King Philip, 52 @ Taunton, 59 – Final – King Philip used a 16-point third quarter to tie the score at 43-43 heading into the final frame, but the Tigers’ defense limited the Warriors to just nine points in the fourth quarter to secure the win. Senior Michael Quinn had a team-high 21 points while John Martins added 12 points and Naz Kenion finished with 11 points. Junior Alex Fritz led KP with a career-high 22 points while Bruce Saintilus added 18 points. Sharon, 43 @ North Attleboro, 50 – Final – North Attleboro senior Nate Gonsalves (13 points) hit a pair of three pointers and junior Ethan Friberg added one as the Rocketeers were able to pull away from Sharon in the fourth quarter. Big Red held a 20-13 lead at halftime but the Eagles exploded for 17 points in the third, as junior Aidan Kane hit three triples and had 11 of his team-high 15 points in the quarter. North had connected on just two threes heading into the fourth but totaled 18 points in the fame to get the win. Senior Josh Montague and sophomore George Ladd each added 13 points for North. 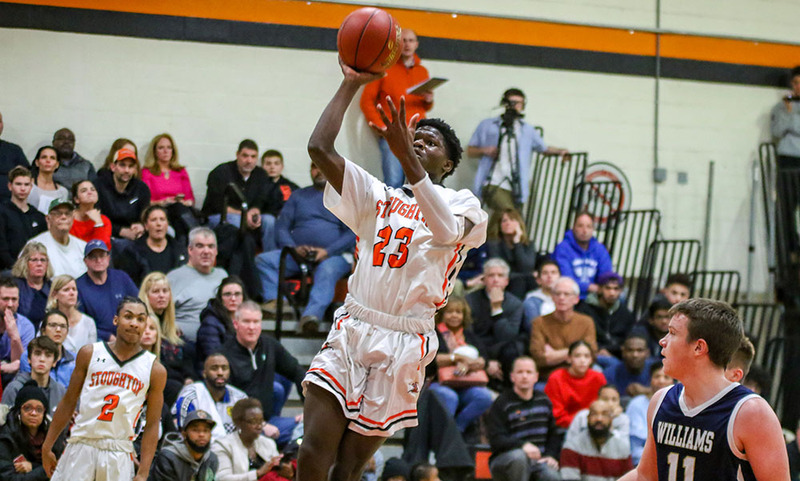 Oliver Ames, 58 @ Attleboro, 28 – Final – Oliver Ames ramped up the defensive intensity in the second half, limiting the Bombardiers to just 11 points as the Tigers ran away with the win. Tate Hadges led OA, which led 33-17 at half, with 12 points while freshmen Caroline Peper and Hailey Bourne each added 10 points. 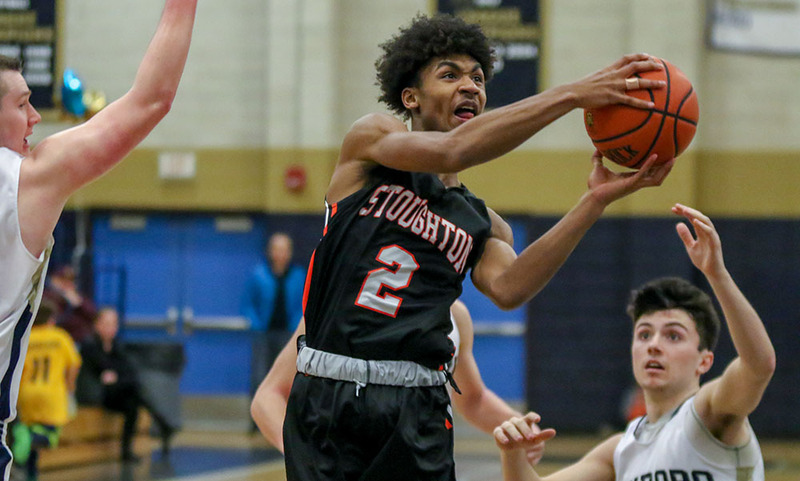 Stoughton, 34 @ Canton, 56 – Final – The Bulldogs clinched a playoff spot with the win. It is the quickest that Canton has clinched a playoff berth in about two decades. Head coach Jim Choquette credited his team’s defensive performance for earning the win and sealing a quick return to the state tournament. Sydnee Hyacinthe had 12 points and Shyanne Trinh had 10 for the Black Knights. Milford, 13 @ Foxboro, 75 – Final – Katelyn Mollica scored 19 to lead the Warriors, who clinched at least a share of their third straight Davenport title. Shakirah Ketant had 13 ponints and 11 rebounds and Yara Fawaz added 12 points for Foxboro. Franklin, 47 @ Mansfield, 32 – Final – Click here for a Recap and Photo Gallery from this game. King Philip, 74 @ Taunton, 37 – Final – Faith Roy scored 21 points, including 16 in the first quarter, helping the Warriors jump out to a big lead right from the opening tip and they never looked back. KP coach Amy Siggens said that the team’s defensive intensity made the difference. Shannon O’Connor added 16 and Faye Veilleux had 12 points for the Warriors, who are one win away from booking a spot in the state tournament. North Attleboro, 52 @ Sharon, 57 – Final (OT) – Ally Brown and Telishya Herbert each scored 13 points for the Eagles, who move within two wins of clinching a playoff spot. Emma Eberhardt and Evanjuline Elisma each scored eight points in the win.